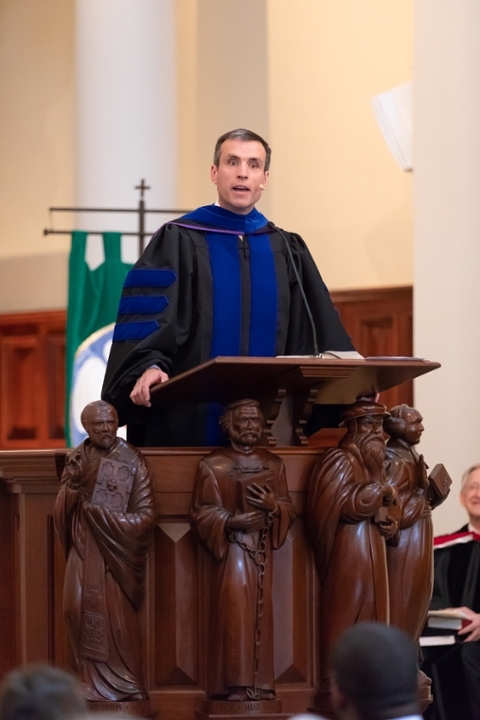 Eldridge, who graduated from Beeson Divinity in 2004, is the first Beeson Master of Divinity (M.Div.) graduate to give the commencement address. Eldridge shared that his first pastorate after graduating Beeson was in Pascagoula, Mississippi, which was a quarter mile from the Gulf of Mexico and right in the path of Hurricane Katrina in 2005. He brought out his framed but wrinkled and damaged diploma from Beeson Divinity as an illustration to show what it means to be a neighbor. “Your preparation for ministry is a call to the messiness of ministry in a real world with hurting and broken people who need one who is willing to be a neighbor,” said Eldridge. “You can minister in a community for years without truly moving in as a real neighbor. You can minister in a church without truly being a neighbor to your congregants and to the community. You can travel your own roads from Jerusalem to Jericho and learn quickly how to avoid the mess and mud and maybe even be successful in the eyes of the ecclesiastical world. How do you grow as a minister of the gospel and therefore as a neighbor? Eldridge asked. It requires that we get our hands dirty and to see, stop and stoop, he said. “The fertilizer of ministerial growth is the tears of the people, the hurts, disappointments, pain, the muck and the mire of real life intersecting with a man or woman called by God,” said Eldridge. Earlier in the service, Samford President Andrew Westmoreland welcomed the graduates and guests to Beeson Divinity’s 30th annual session and to Samford University’s 176th year. For some, he was welcoming them back to commencement a second time after a last-minute decision to cancel the December 2017 commencement ceremony due to a snow event that caused a power outage. “One might observe that today’s events began in 1841 when Howard College received its charter from the state of Alabama, but our deeper roots go into the very heart of the church, to the day the Holy Spirit was poured out on all who believe and the gospel of the living Lord Jesus was first proclaimed,” Westmoreland said. In his opening remarks, Beeson Divinity School Dean Timothy George, spoke about the importance of both academic and spiritual formation in theological education. “Today on this occasion we bring together the program of commencement with our service of consecration,” he said. “Beeson Divinity School is a graduate school of theology. It is also a community of faith and learning. Since the December 2017 commencement was cancelled, the May 4 commencement ceremony combined graduates from December and May. Thirty students graduated with degrees in Master of Arts in Theological Studies, M.Div., and Doctor of Ministry. Three M.Div. students, who will graduate in August, walked early. Watch Beeson Divinity’s May 4 commencement and service of consecration.